With a major victory against Aronian in the ninth round on Monday, Vishy Anand joined Karjakin at the top position in the Candidates tournament in Moscow. At the end of three rounds, Levon Aronian (Armenia), Viswanathan Anand (India) and Sergey Karjakin (Russia) were in the lead. Sergey Karjakin became the sole leader after round 4 by defeating Vishy Anand with the help of a highly interesting novelty.This remained the case until Aronian defeated Hikaru Nakamura(USA) in a dramatic encounter in the sixth round to share the lead with Sergey. Vishy also won his sixth round match against Peter Svidler(Russia) in a fast-paced kingside attack.In the 7th round,all games were drawn except that of the two tailenders, Nakamura and Topalov,which was won by the American.The 8th round of the tournament marked the beginning of the second half of the tournament. Caruana beat his compatriot Nakamura when both launched attacks against the enemy kings. It is still anybody's guess as to who would take on the defending Champion Magnus Carlsen this November. Photo exhibition “The Moscow Gambit” opened on Thursday at the history museum Gorky Park as part of the Candidates Tournament program.The well-known Moscow veteran 90-year-old Ivan Slyusarenko and top Grandmaster Ian Nepomniachtchi opened the event. 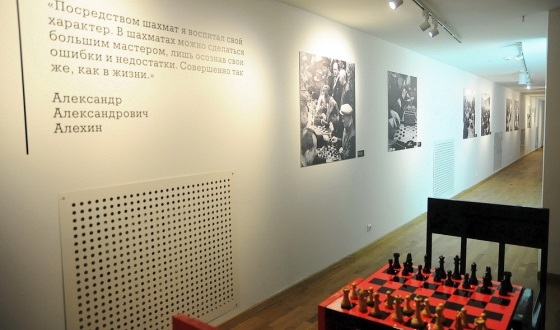 The exhibition is presenting the 100 years of chess culture in the Russian capital. The Romanian International Open 2016 is being held from March 16-23 in Alba Iulia, one of the most beautiful cities of Transylvania.There are 34 participants from 8 countries, with an average rating of 2352.Eleven Grandmasters are participating of whom the top seed GM Istratescu Andrei,GM Nevednichy Vladislav and IM Deac Bogdan-Daniel are leading with 5/7 points. The 20th Annual Mid-America Open was held from March 18-20 in St. Louis,Missouri.The main open section had 57 participants.GM Alexandr Shimanov took a clear first place with 4.5/5 points to claim the top prize of $2100.The total prize fund was $20,000. The New York Times has a big story on William Lombardy, a former catholic priest and strong chess Grandmaster, who coached and seconded Bobby Fischer from the age of eleven to the World Championship in 1972. Lombardy, now 78, faces eviction from his apartment in New York, over rent arrears that he hotly disputes. William James Lombardy is an American chess Grandmaster, chess writer, teacher, and a former Catholic priest. The Reykjavik Open has finished, and the big Indian delegation, comprising all of exactly two players, was incredibly successful! GM Abhijeet Gupta crowned himself as the winner of the 2016 edition of this prestigious open on top of Andreikin and Cheparinov. 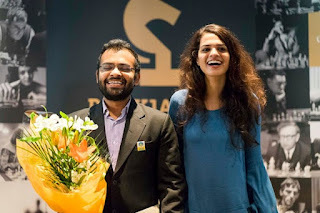 Meanwhile IM Tania Sachdev bagged not only the best woman's prize, but also her second GM norm. Indian Summer in the Icelandic Capital! Hosted by Indian Oil Corporation Ltd. at Mysuru the All-India Public Sector Chess Tournament 2016 was held from 14-18 March 2016. Almost all of India's top players are employed by the petroleum companies and they were present to represent their teams in this six-team round-robin contest held with the time control of 45 minutes + 30 seconds increment from move one.The tournament was won by Team ONGC, represented by manager D.V. Prasad, Krishnan Sasikiran, Vidit Gujrathi, Koneru Humpy, Deep Sengupta and Neelotpal Das. Just eight, but this budding Mumbai chess prodigy Dev Shah exhibits the promise to make it to India's chess elite one day. 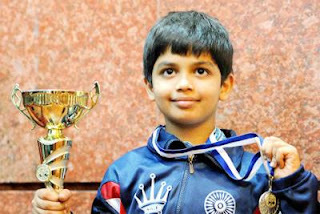 Though he had been playing quite well for some time, it was his Silver medal in the U-8 World Youth Chess Championship in Greece which forced the Indian chess circuit to sit up and take notice of this Class III student. 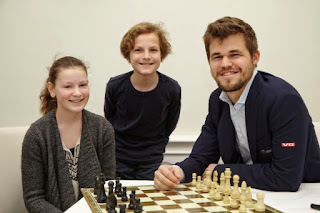 In February Magnus Carlsen was in Hamburg, Germany to play a simul. Henrike and Luis, two young chess players were invited by "Dein Spiegel", a magazine for children between the age of 8 and 14, to interview the World Champion. They used the chance to ask unusual and open questions, e.g. whether Carlsen cries after losing a game or why chess is better than the Gameboy. GIRI : "MAGNUS AND I ARE VERY CLOSE IN TERMS OF STYLE"
Anish Giri, the world no. 4 and the youngest player in the 2016 Candidates Tournament, is only one point off the lead with five rounds to go and still has a real chance of qualifying for a World Championship match against Magnus Carlsen. So far, though, he’s mainly attracted criticism for a super-solid approach that has led to nine draws in nine games. What does Anish himself think about his style? He talked about it in a long interview before the event.